Young saguaro cactus were peeking out from its bursage nurse plant. 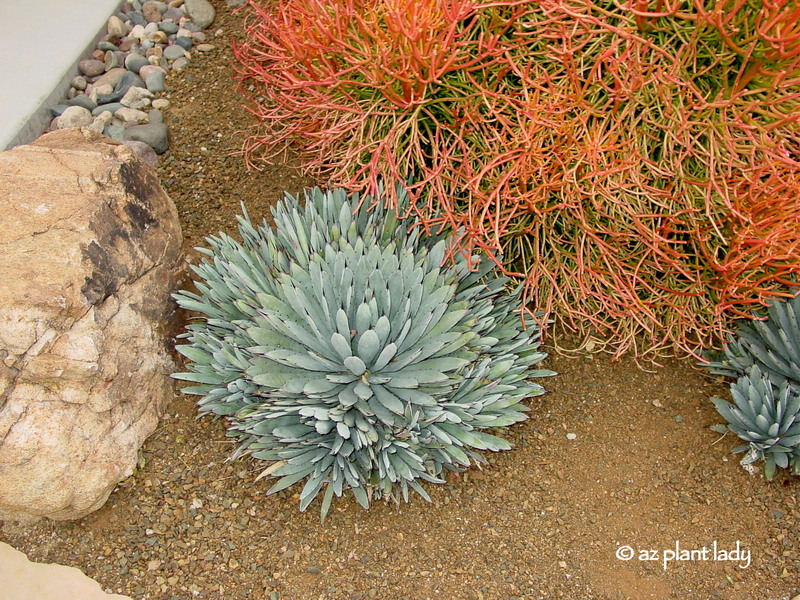 As you walk through the desert, there are many opportunities to view some of the striking cacti and their unique shapes. 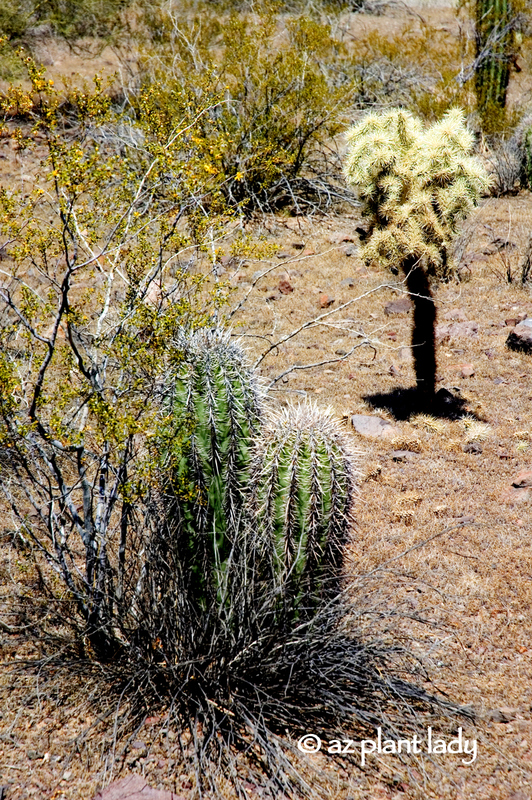 What is not initially apparent, are the many examples of plants helping young cacti survive. However, if you look closely, it is all around you – desert shrubs and trees sheltering growing cacti from the harsh desert climate. Despite their tough, prickly appearance, cactus are quite vulnerable. Of the thousands of seeds that are released by each cactus, only a tiny fraction grow into new cactus plants. Most would not survive if it were not for “nurse plants.” These plants provide much-needed protection from the sun, cold temperatures and predators (including humans). Nurse plants also provide much needed additional moisture for the new cacti. It is easy to walk by and not even notice the presence of the small cacti growing underneath nurse plants. Most of the year, the fishhook cactus (Mammillaria microcarpa), pictured above, are almost impossible to see. It is only in the spring when they are blooming that you can spot them. Hedgehog cactus outgrowing it’s bursage nurse plant. For the smaller cacti species, bursage (Ambrosia deltoidea) most often serves as the nurse plant. It also often serves as the first nurse plant for saguaro cacti. Creosote (Larrea tridentata), palo verde, mesquite or ironwood trees often serve as the nurse plants for larger species of cacti. As it grows larger, it requires more water and nutrients from the soil, which leaves little for the nurse plant. So frequently, the nurse plant will decline and die as you can see from the photo above. 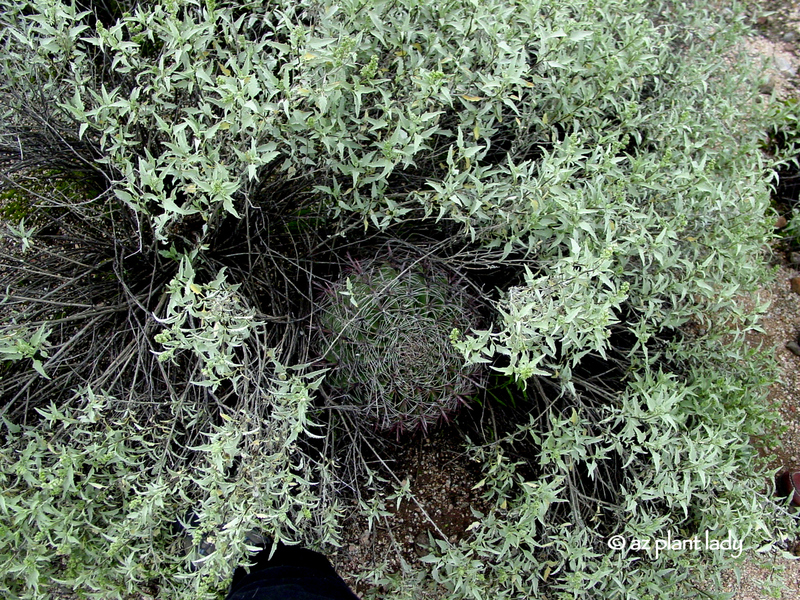 Young buckhorn cholla emerging from its bursage nurse plant. So next time you have the opportunity to take a walk in the desert, look around….you will most likely see examples of this unique relationship of plants helping young cactus survive. Do you like prickly cactus? I have a few favorites, one being santa-rita prickly pear (Opuntia violaceae var. santa rita). The color contrast of their blue-grey pads and the shades of purple are so striking in the landscape. 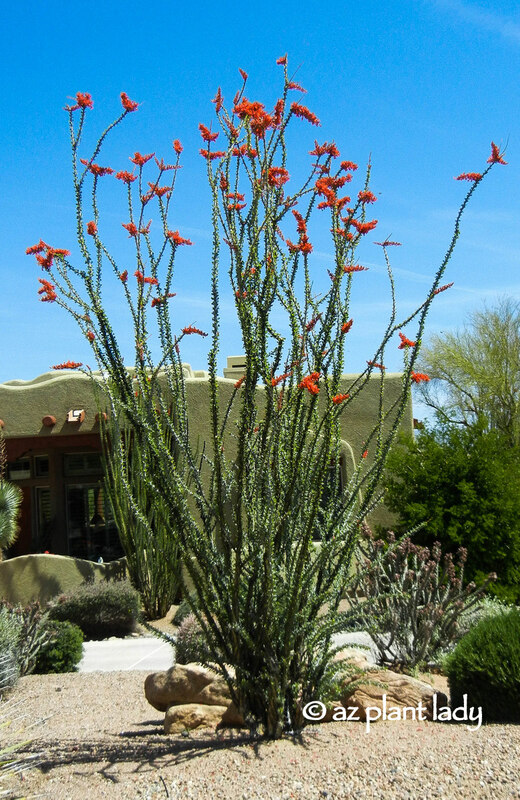 This cactus makes a beautiful accent plant for the landscape. Both the pads and fruit are edible, (but you might want to remove the spines first ;-). Cold temperature and drought intensify the purple color. Santa-rita prickly pear is native to the Southwest regions of North America. They can grow as large as 6 ft. X 6 ft., but can be pruned to maintain a smaller size. Pruning is done carefully, by making pruning cuts at the junction where the pads connect. Lovely yellow flowers appear in spring followed by red fruit in the summer months. Javelina, rabbits and pack rats will sometimes eat the pads. Pack rats use the pads to make their homes. 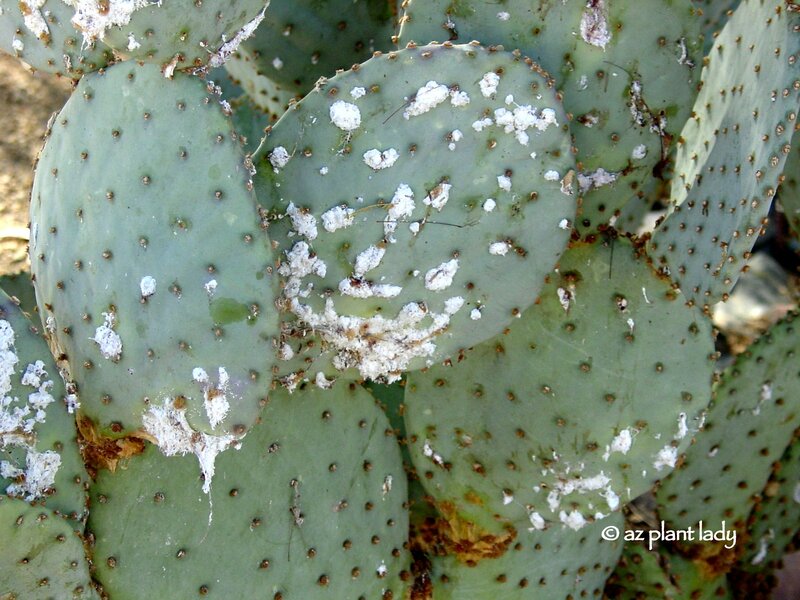 The pads of the prickly pear are covered with clusters of 2″ spines as well as tiny spines known as glochids. Glochids are incredibly irritating to the skin and detach from the pad very easily. Their tips have a small barb, which makes them difficult to remove from your skin. If you need to handle them, use a few layers of newspaper or a piece of carpet. Do not make the mistake of touching the pads with gloves because the glochids will attach to your gloves and render them useless, (I ruined a perfectly good pair this way). **There are different ways to remove these small spines, including applying Elmer’s glue (letting it dry and then pulling them off), but many people have reported greater success using duct tape. USES: In addition to serving as an accent plant in the landscape, this prickly pear species can also be used as a screen. Some may be surprised to learn that they also make excellent container plants, just make sure they are not near any foot traffic areas. They do well in full sun or light shade in well-drained soil. MAINTENANCE: Prickly pear is very low-maintenance plants. I always use tongs to pick up the pads that I have pruned, or you can use newspaper. 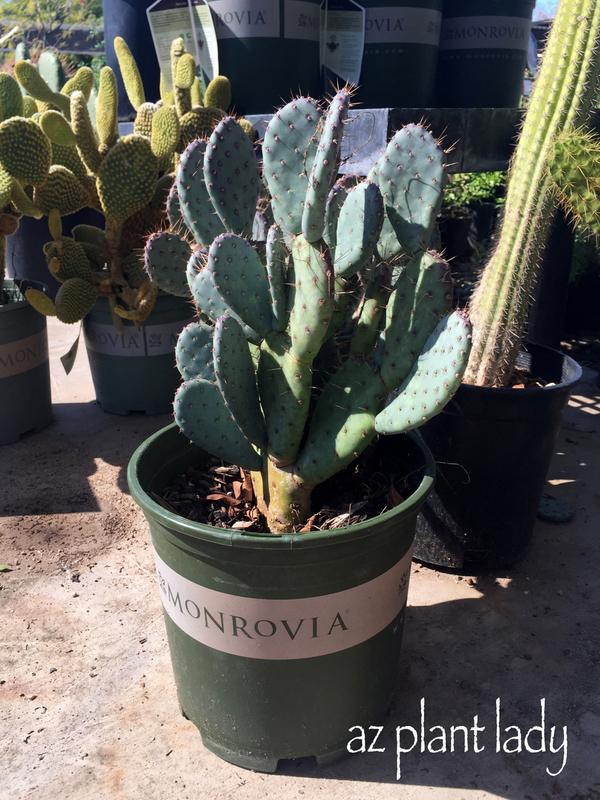 Although they are incredibly drought-tolerant, watering once a month during the hot summer months, in the absence of rain, will be appreciated and will improve the appearance of your prickly pear. Shriveled pads indicate acute drought-stress. Many people believe that the appearance of white, cotton-like areas on the pads is a sign of a fungal infection. However, it is caused by a small insect that secretes the white cottony mass, called cochineal scale. Control is straightforward – simply spray off it with a strong jet of water from the hose – that’s it! 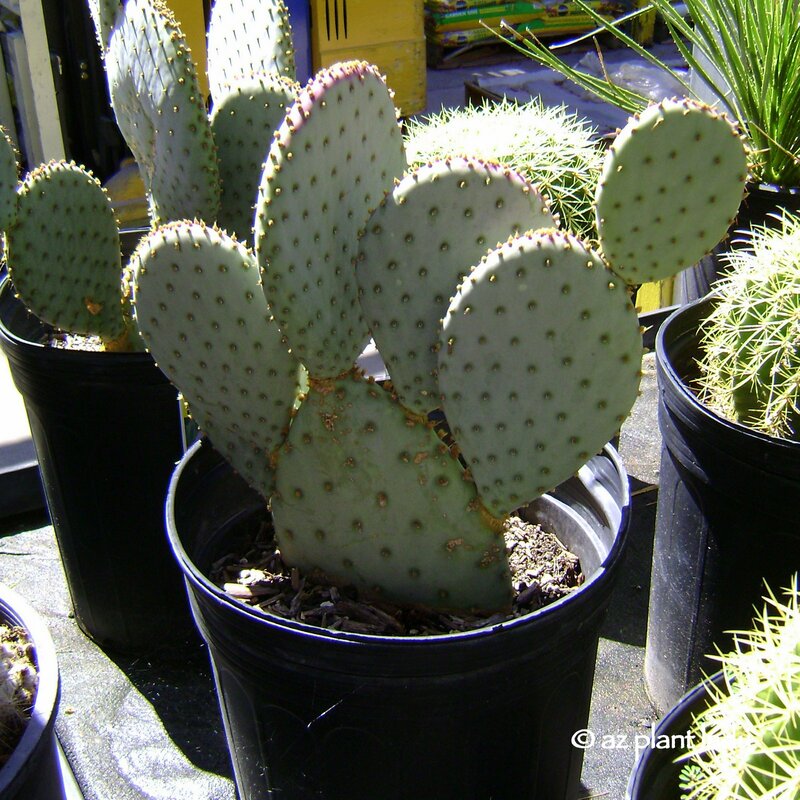 PROPAGATION: Prickly pear can be planted from seed, but there is a much easier way. Just cut off a pad that is at least 6 inches tall. Put the pad upright, in a shady, dry place for at least about two weeks. This allows a callus to form at the bottom. Plant with the cut end down, do not water for the first month because the bottom is susceptible to fungal infections. After the first month, water every 2 – 3 weeks until established. If planted in the summer, provide shade until established (about three months). *I generally do not recommend planting in the winter but encourage waiting until spring when the soil warms up. If you have a large prickly pear, you can prune it, or you can start over by taking it out and cutting off some of the pads and plant them in the same place. Many of my clients have done this and been happy with the results. INTERESTING HISTORICAL FACT: The Aztecs would cultivate prickly pear cactus infected with cochineal scale because the insects secrete a dark red dye with crushed. This was used to dye cloth. The Spanish exported this dye from Mexico back to Europe where it was used to dye royal garments and British military uniforms. The dye was highly valued by the Spanish, next to gold and silver. It takes 70,000 insects to produce 1 pound of dye. *This is but one of many beautiful prickly pear species available to the home gardener. 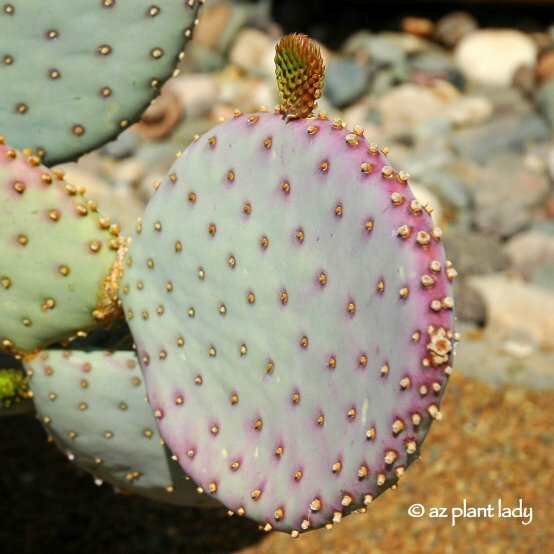 Do you have a favorite species of prickly pear cactus? There are some signs that summer is beginning to fade and that fall is around the corner. The stress that the high temperatures of summer bring has caused many plants to slow down their growth. However, the slightly lower temperatures in September bring on a flush of new growth for many trees, shrubs, and succulents in the garden. I enjoy being out in my garden this time of year and seeing many of my plants rejuvenated. With the somewhat cooler temperatures, I am now seeing many gardeners venturing outside and taking stock of the condition of their landscape. Fall is a busy time in the desert garden because it is the ideal time to install many types of plants, which will be discussed in a separate post in early October. SHRUBS: I just finished lightly pruning my ‘Rio Bravo’ sage (Leucophyllum langmaniae). Summer flowering shrubs that are cold-hardy look their best when lightly pruned at this time to help reign in rangy, sprawling growth. This should be only done with hand pruners only. Do not use a hedge trimmer and shear your shrubs. They should have a pleasing natural shape when you are finished. Do not prune back frost-sensitive plants at this time. ANNUALS: Although the local nurseries are abundant with winter annuals, I don’t recommend planting them now. The temperatures are still quite hot, and there is a good chance that they will not make it. In the past when mid-September came, I would load up the truck with 100+ flats of annuals to plant around the community where I worked as the horticulturist. I would then spent the next four weeks making repeated trips to the nursery to replace dead plants that just could not handle the heat of early fall. From then on I would wait until October to change out summer annuals and replace with winter annuals. As a result, we suffered very little plant loss. TREES: Mesquite and Palo Verde trees that are overgrown can be lightly easily pruned back. Resist the temptation to heavily prune at this time. January and February is the time for heavy pruning to occur for these trees. 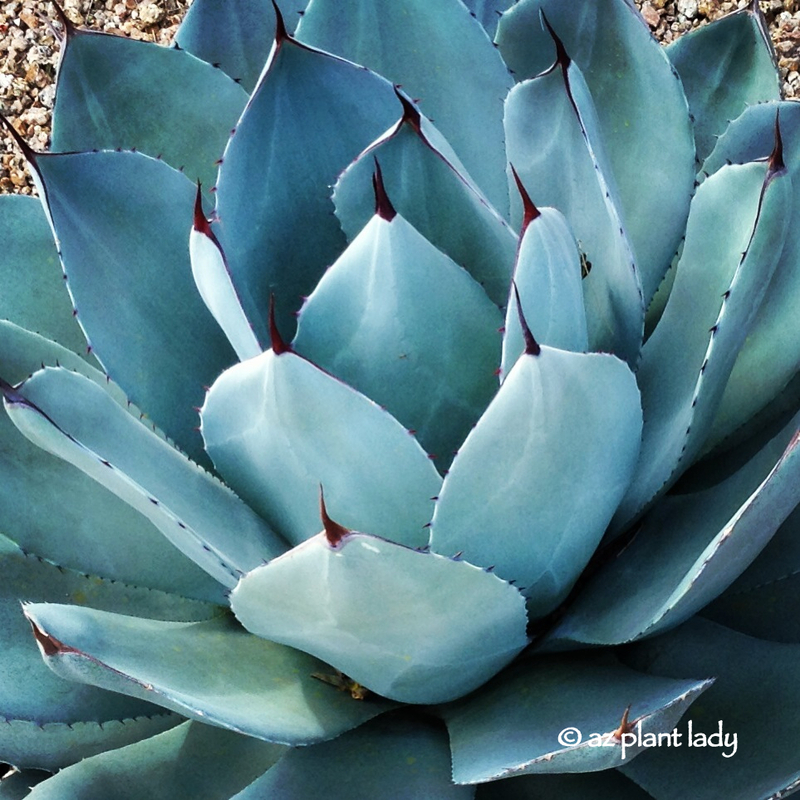 SUCCULENTS: Cacti, agaves and other succulent plants do best when planted when soil temperatures are warm, which makes September a great time to install them before cooler temperatures arrive. Prickly Pear cactus can be pruned back this month if needed. Problems with agave may show up this time of year. If your agave suddenly collapses, there is a good chance that they have gotten an infection with agave snout weevil. There is no cure and the agave should be removed, it will be smelly due to the decay the weevil causes – and not just a little stinky. One of my (least) favorite memories happened years ago when I worked as a horticulturist on a golf course. One year, we had to remove countless agaves throughout the landscapes due to a large infestation – the smell was awful. If this happens to your agave, do not plant another agave in the area – use another type of plant instead. ROSES: Roses should be lightly pruned and fertilized this month (see earlier post for details). CITRUS: Make sure to fertilize your citrus trees if you have not already done so (see earlier post for details). NEXT MONTH – get ready for planting and wildflower garden preparation! 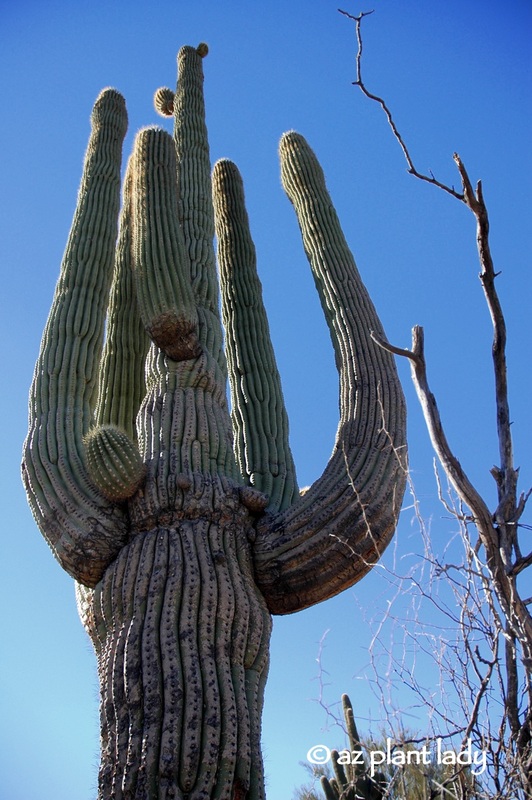 How Long Does It Take Before A Saguaro Grows Arms? In the past, people have asked me how long does a saguaro cactus arm take to grow back. The commonly held belief is that it takes 100 years before they will develop an arm. However, as with much plant information, this answer is not always correct, it actually takes less time for a saguaro cactus to grow its arm back in a landscape setting than it’s native habitat. The most critical factor in determining the timing of when a saguaro will start to grow an arm is the availability of water. Put simply, the more water a saguaro receives, the more quickly it grows. In a landscape setting where irrigation is present, a saguaro will grow much more rapidly then they do in their natural desert habitat. Saguaro cacti that grow in southern Arizona (near Tucson) grow more quickly than those in the western areas of the Sonoran desert because there is more rainfall in southern Arizona. A saguaro growing in its native habitat can take 50 – 100 years to grow arms. In a landscape setting, arms often appear much earlier. https://www.azplantlady.com/wp-content/uploads/2009/08/saguaro_cactus_sonoran_desert_arms.jpg 640 378 arizonaplantlady@gmail.com http://www.azplantlady.com/wp-content/uploads/2018/10/favicon.png arizonaplantlady@gmail.com2009-08-29 21:13:002019-02-10 14:48:59How Long Does It Take Before A Saguaro Grows Arms? I just had to share this photo of my flowering Arizona fishhook cactus(Mammillaria grahamii) also known as (Mammillaria microcarpa). While walking outside in the garden this morning, I caught a glimpse of pink off in the distance. As I went over to explore further, I noticed my little Arizona fishhook cactus in full bloom. I don’t have many cacti in my garden, but even if I did, this little one would probably still be my favorite. Pink crowns of flowers appear off an on throughout the summer months in response to rain much to the delight of native bees. I found this little cactus growing alongside a large boulder in an area of desert that was getting ready to be graded for a new house. At the time my crew and I were digging up different types of cacti, like barrel cacti and teddy bear cholla, to relocate them around the site out of harm’s way. I received permission to keep this little one. One of the things that I love about this little cactus is it flowers off and on during the summer months in response to rain or a small amount of water from my garden hose. Look closely at the spines, you can see where it gets its common name with their fishhook shape. Believe it or not, I can hold this cactus (carefully) without getting pricked. During the rest of the year, this small cactus fades into the background and is hard to see. 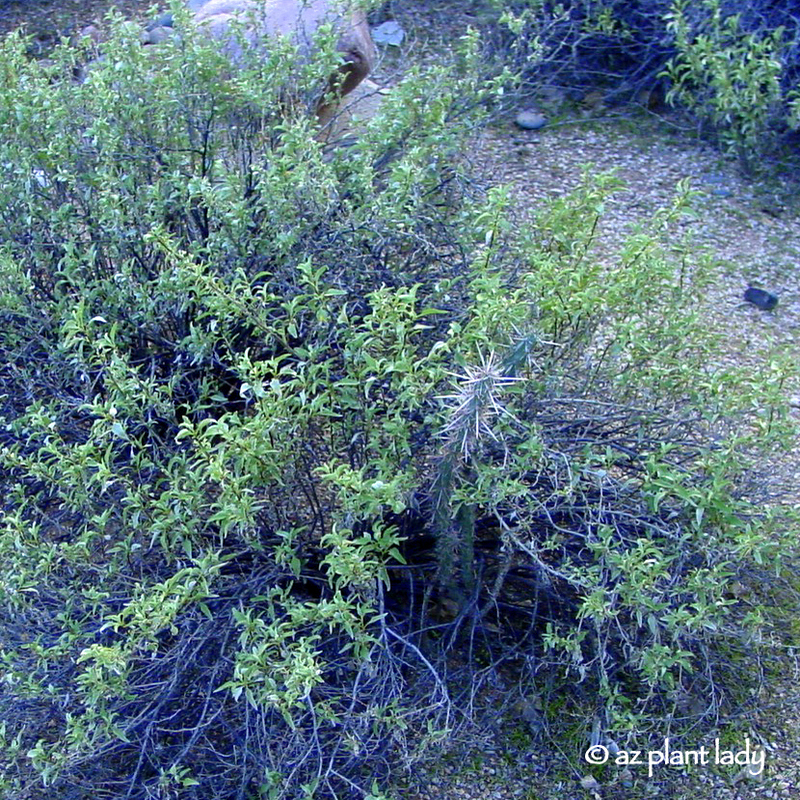 You can find it growing underneath bursage shrubs throughout the desert. Do you have a favorite flowering cactus in your garden?